One of the main reasons that I moved to western North Carolina is because of the beautiful hills and mountains. Being a native born flat-lander, I longed for this terrain. Now I deal with the 45-degree slope that my house sits upon. 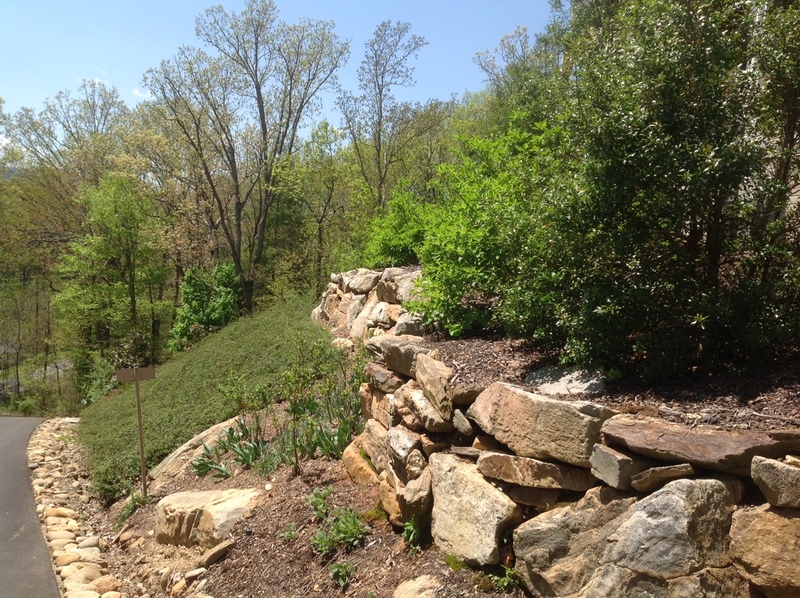 Erosion can be a major problem with a hillside, particularly with new construction where all of the topsoil has been scraped away. A heavy rain will quickly create rivulets that carry away even more soil. 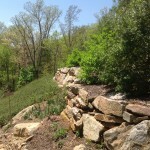 Heavily mulching a hill helps, but plants are essential for holding the soil in place. But before selecting plants, have the soil tested to determine pH and nutrient needs, and then consider the amount of sun the hillside receives, the size of the area to be planted, and whether you desire evergreen or deciduous plants. Just driving around the freeways in Asheville will show you grasses, trees, shrubs, and bulbs that look good and hold the soil. Perennials are also an option. But if you desire a groundcover, there are many choices. For a large sunny hillside: cotoneaster (Cotoneaster salicifolius) tolerates drought and produces a berry that the robins like, junipers are needled evergreens that come in various colors, textures and heights, creeping phlox (Phlox subulata) flowers nicely in early spring and is evergreen, or creeping raspberry (Rubus rolfei) that will form a dense carpet. These will all cover a large area. For a smaller sunny hillside: ice plants (delosperma cooperi) dianthus, sedums, creeping rosemary (Rosmarinus officinalis ‘Prostratus’) and Mondo Grass (Ophipogon japonicas) are options. Note that some prefer moist soil and others, drier, well-drained soil. On shady hillsides, observe whether the hillside is partially or fully shaded and if there is competition from tree roots. For larger areas, pachysandra is a dense evergreen, carpet bugle (Ajuga reptans) flowers in the spring, green and gold (Chrysogonum virgianum) has yellow flowers in the spring, and lily-of-the-valley (Convallarimajalisa) which can spread aggressively but has fragrant, bell-shaped flowers are options. There are many groundcovers to try. Do not use English Ivy as it is an invasive and a problem in our area. When planting any groundcover, prepare the soil first by removing annual and perennial weeds. Add organic matter such as compost into the soil to improve drainage. Planting in the fall allows the groundcover to establish stronger root systems before they are taxed by summer heat. Keep the plants watered. Even drought resistant plants need regular watering to get established. Mulching around the plants will keep down weeds, help prevent erosion and retain moisture. After planting, it is essential to keep the area weed-free as weeds compete for nutrients and space. The first couple of years will require more weeding, but as the plants establish and spread, they will help prevent weeds from establishing. Groundcovers are not carefree, but once established, maintenance is minimum. Article written by Lorraine Cipriano, Extension Master Gardener Volunteer.